Mistra EviEM | SR4 How does farming affect the organic carbon content of arable soils? SR4 How does farming affect the organic carbon content of arable soils? The carbon content of arable soil depends very much on how farming is conducted. Photo: Jan Håkan Dahlström/ Bildhuset/ IT. Agricultural land has great potential to store carbon. With the right choice of cultivation methods and cropping systems, it can be transformed from a source of greenhouse gases into a sink for carbon dioxide. EviEM has completed a systematic map examining the evidence relating to how different farming methods affect the amounts of organic carbon in arable soils. On farmland that is harvested annually, the carbon content of the soil declines as organic compounds are broken down, removed in the form of crops, leached out by run-off or lost by erosion. Globally, the top one metre of the soil contains roughly three times as much carbon as the above-ground biomass of plants, and twice as much as the atmosphere. Changes in the stock of soil carbon can therefore cause significant changes in the atmospheric concentration of carbon dioxide. On a global scale, the corresponding loss from farmland is of the order of 100 to 1,000 million tonnes of carbon every year. However, there are methods that can reduce carbon losses or even increase the sequestration (capture) of carbon in arable soils, even though the land continues to be farmed. Any intervention that increases the amount of soil organic matter, or reduces its decomposition, results in more carbon being stored in the soil. 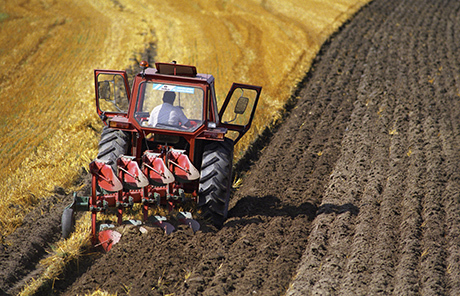 Trials involving modified ploughing have led to higher carbon levels in certain areas, although the results in Sweden have been mixed. Growing of cover crops, long-term leys or use of crop residues as a fertiliser could also lock up more carbon in arable land. Increased carbon sequestration in arable soils offers major benefits: It improves yields owing to better soil structure and fertility, and it reduces greenhouse gas levels in the atmosphere, helping to mitigate the threat of global warming. The Swedish Board of Agriculture has come to the conclusion that the potential for carbon sequestration in soil is considerable, but that it is uncertain how different farming methods affect stocks of soil carbon in a Swedish climate. To try to reduce this uncertainty, EviEM has completed a broad map of the scientific literature: what evidence exists and what has been studied in relation to the impacts of agricultural practices on arable land on soil organic carbon? The project commenced in August 2013 and is led by Professor Katarina Hedlund at Lund University. A broad map of the evidence has been completed, which has catalogued the evidence base by assembling a database of all studies investigating the impacts of arable farming practices on soil organic carbon. This systematic map consists of a report that explains the reviewing process, a searchable database describing the included studies, and a web-based geographical information system (GIS) that displays the studies on a geographical map. The searches for literature initially identified almost 25,000 articles as possibly relevant to the subject of the review. Through several stages of screening, most of these articles were subsequently excluded, but after close reading, 735 studies have been assessed as useful. The map identified four broad categories of arable farmland practices, each having been investigated by between 238 and 307 studies: soil amendments (additions and modifications to the soil, for example through the addition of lime or crop residues), crop rotations (such as monocultures or complex rotations of different crops each year), fertiliser (inorganic and organic), and tillage (different depths of soil disturbance). Studies were found across the included climate zones, and are displayed visually in the map below. There was a notable lack of studies from Russia, a sign of a knowledge gap in the literature. Most studies sampled soil only once: these snapshots are not as reliable as long-term, continuous measurements, which were only found in a small number of studies. Click here to read a help file for making the most of the interactive GIS. The systematic map was published in the journal Environmental Evidence along with an EviEM report and factsheet (see links to the right). Although the systematic map has been completed we welcome the submission of evidence that might be relevant for an update of the review. Please visit this page and submit a brief description of any relevant research that you believe should be included in such an update, particularly grey literature, such as reports or theses. 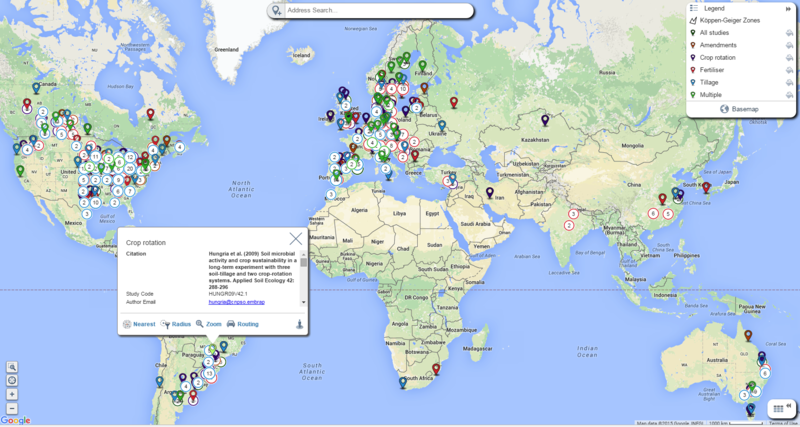 The second stage of the project involved individual systematic reviews that focused on targeted subsets of the evidence in the map, and included quantitative analysis of the overall findings across the evidence base (see links at the bottom of the page). The review team at a meeting in August 2013. 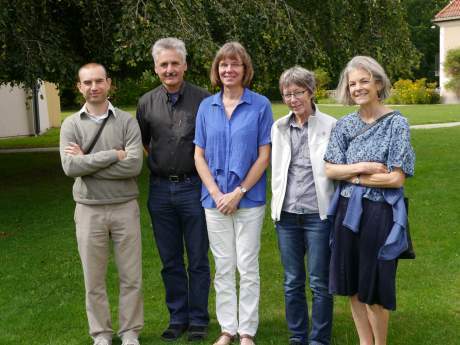 From left to right: Emanuele Lugato, Thomas Kätterer, Katarina Hedlund, Ingrid K. Thomsen, and Louise E. Jackson. Helene Bracht Jørgensen and Neal Haddaway are missing in this picture. Photo: Sif Johansson. Review SR10 – How does tillage intensity affect soil organic carbon (SOC)? Review SR11 – Which agricultural management interventions are most influential on soil organic carbon (using time series data)? Review SR16 – How do selected crop rotations affect soil organic carbon?